Disability charities must do more to support the disabled activists who are fighting austerity through direct action protests, according to a leading figure in the disabled people’s movement. 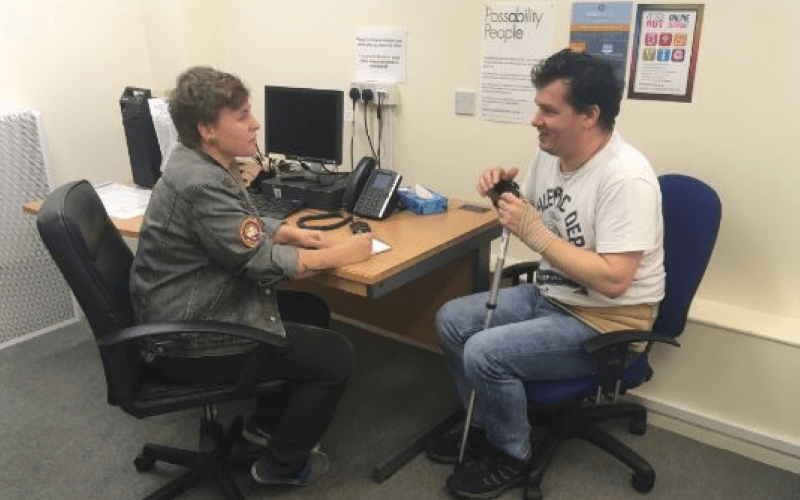 Jackie Driver, who has chaired the Manchester-based disabled people’s organisation Breakthrough UK for the last 13 years, said that grassroots organisations like Disabled People Against Cuts (DPAC) had received “negligible” support from the wider movement. 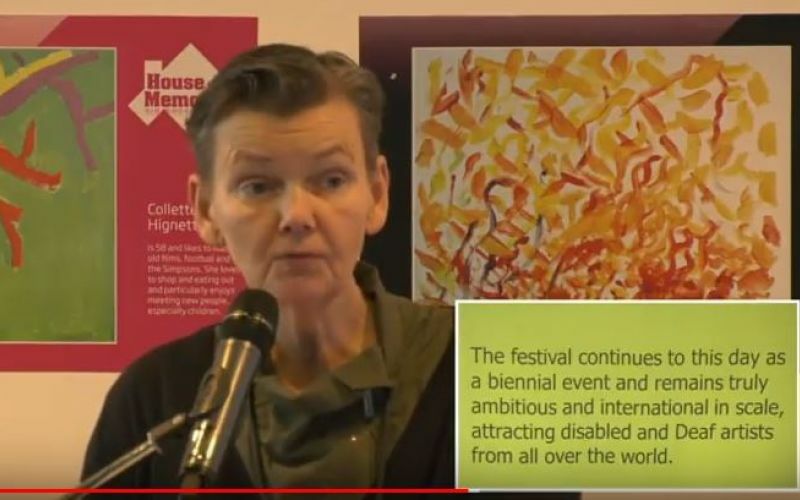 In a public lecture in Liverpool on Sunday, held on the UN’s International Day of Persons with Disabilities (IDPD), she said there was a risk that the “resistance” to “crushing” government cuts would remain “fractured and ineffective” unless there was solidarity with groups like DPAC. Driver was delivering the third annual Edward Rushton Social Justice Lecture (pictured) at the Museum of Liverpool, an event organised by the user-led disability arts organisation DaDaFest. She said that charities – with their “shiny new social model approaches” – were often seen as a “blight” on the “landscape around disability”, and she warned of the “ever present” threat that they would become “the accepted vehicle for disabled people’s empowerment”. She told Disability News Service later that “established disability charities, along with countless others, need to be allies to the disability rights movement, and in doing so need to recognise the role of the disability activists who risk all to raise significant issues and not dismiss them as radical fringe elements”. She said that those “allies” of the disabled people’s movement who have more “economic, political or social capital” have a greater responsibility and capacity to support the idea of “nothing about us without us”, and to recognise the leadership of disabled people’s user-led organisations. She spoke in her lecture about disability rights and activism, direct action, and the fight for equality for disabled people. And she pointed to the historic advances that had come about because of campaigns by grassroots campaigners such as the Disabled People’s Direct Action Network (DAN) and the Campaign for Accessible Transport, which used “direct action to fight injustice”. There was a need, she said, “to be very clear about grassroots activism and the leading role it plays in securing advances”. Her comments came only days after another leading figure in the disabled people’s movement, Professor Mike Oliver, delivered a stinging rebuke to disability charities that he said had “proved predictably useless at defending the living standards and lifestyles of disabled people” from the government’s “vicious attacks, while continuing to do very well for themselves”. Driver warned, as Oliver had, of the reduction of disabled people to stereotypes, such as “tragic or heroes, shirkers or strivers, deserving or undeserving”, particularly through the focus on the Paralympics and disabled war veterans. She also paid tribute to the “innovation and leadership role” of Sir Bert Massie and Lorraine Gradwell, two “prominent and significant freedom fighters” who have both died in the last few months, and who both lived in the northwest of England. The event commemorated the duo’s “vast contributions to the disabled people’s movement”. Driver also paid tribute to the historical contribution to the movement of other disabled people and organisations from the north-west, including the Manchester branch of the Union of the Physically Impaired Against Segregation, Greater Manchester Coalition of Disabled People, the Centre for Disability Studies at the University of Leeds, DaDaFest, and her own organisation, Breakthrough UK. Together, she said, they were the “northern powerhouse of the disability rights movement”. Although Driver is programmes principal at the Equality and Human Rights Commission, she was speaking as chair of Breakthrough UK, which tomorrow afternoon (Friday 8 December) will mark the beginning of its 20th anniversary year with an event at Manchester Central Library. The event will celebrate the contributions of all the disabled people and organisations who have worked with and for Breakthrough, as well as the achievements of Gradwell and Breakthrough’s other founder, Kevin Hyett, who died in 2004. Gradwell was asked by Manchester City Council – which is still a core funder – to set up the organisation in 1997, after the local authority promised to work with local disabled people to provide them with real jobs. Since then, Breakthrough has provided employment and independent living support to more than 5,000 disabled people in Manchester, as well as consultancy, training and policy advice to local businesses and public organisations on how to remove disabling barriers. Elsewhere on IDPD, the European Network on Independent Living (ENIL) warned of the continued impact of austerity and cuts on disabled people’s opportunity to access independent living, including in the UK, “where increasingly, young disabled people with high support needs are being told their only option is residential care”. ENIL said there was a “worrying trend” across Europe of funding the “building and renovation of institutions”, or replacing “large residential institutions with other types of segregated settings”. Meanwhile, Northern Ireland’s Human Rights Commission and its Equality Commission marked the international day by warning the UK government that its welfare reforms had imposed “real hardship” on many disabled people across Northern Ireland. They said that further mitigation measures were needed to prevent the roll out of social security reforms causing them further harm. In Wales, Disability Wales marked IDPD by announcing the names of seven talented role models selected as part of its new Embolden campaign. The campaign aims to change negative perceptions of disabled people by sharing stories about the achievements of disabled women in Wales, and provoking conversations that challenge attitudes to disability. Nominations came from the Welsh public, and awards will be presented at an event next March to Anita Davies (community activist); Sian Preddy (career success); Stephanie Back (arts); Anastasia Blease and Tina Evans (sporting excellence); Barbara Stensland (education); and Janice Partridge (in the category of “amazing in any other way”). A posthumous award will go to the widower of Julie Marsh, a central figure in the Welsh disability movement who died in 2002. The Embolden campaign is part of the celebrations that will mark next year’s centenary of women in Britain obtaining the vote in March 1918.